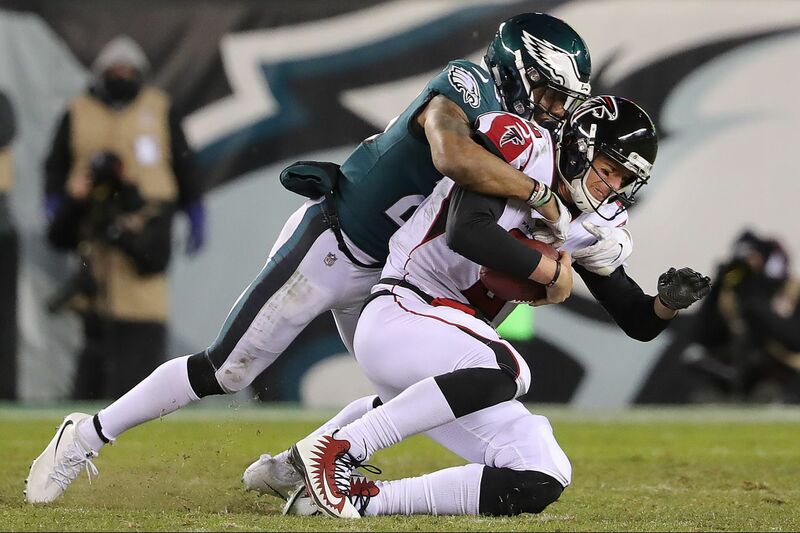 The EaglesÕ Rodney McLeod, left, sacking Falcons QB Matt Ryan during the teams' playoff matchup in January. The Eagles and Falcons are well acquainted, having played each other in each of the previous three seasons, including in January's divisional playoff round. Atlanta, of course, hasn't played a game since, excluding the preseason. Aside from a few minor changes, the players and the schemes are relatively the same as the teams meet again in Thursday night's 2018 season opener. The Super Bowl-champion Eagles don't look much different, either. Both teams have dissected the film from that game. Eagles DC Jim Schwartz: We didn't wake up yesterday morning and dust off the exact same game plan from the playoff game, and I'm sure they haven't done that, either. But you are what you are. Eagles safety Malcolm Jenkins: Those players, especially the quarterback, have been in that system for a while. You don't just uproot that. The preseason has been pretty vanilla, but some of their core concepts still show up. The Falcons use a lot of personnel formations and can often keep defenses in base with two-tight-end and two-back sets. In last year's playoff game, the Eagles were in base for more than a third of the game, which meant that linebacker Dannell Ellerbe (since departed) was on the field a lot. Atlanta also has a jumbo package. On this play, the Eagles went heavy with four linebackers to match, but running back Tevin Coleman got to the corner behind a pulling guard who was matched up against Jenkins. Schwartz: They are one of the few teams that actually employs a fullback. So they do run some two-back sets. You'll see probably six different personnel groups with us, matching what they do offensively. They use two-tight end packages. They use two-back packages. They have two backs where it's two halfbacks, not a fullback. They have four-wide packages. The traditional three-wide, extra offensive linemen. The Eagles will be light at linebacker with Nigel Bradham serving a one-game suspension. Jordan Hicks is back in the middle, but Kamu Grugier-Hill and Nate Gerry, who will start on the outside, have little experience on defense. The Falcons threw out of two-back or two-tight-end sets on 14 of 19 plays last year, like on this play when quarterback Matt Ryan threw to receiver Julio Jones for a quick six yards on first down. If you're on defense and you dress, Schwartz will often find a way to get you on the field, and the Falcons' various groupings almost require it. Schwartz: Substitutions, personnel matching was a big part of the games we played the last two years against them, and I would expect the same thing to be in this game. Atlanta may just as easily run out of three-receiver sets vs. nickel, as they did here with Coleman picking up 12 yards. Coleman rushed for 79 yards on 10 carries, but the Eagles limited Devonta Freeman to 7 yards on 10 carries. The running backs are also a part of the passing game. Jenkins: Besides having two fresh backs all the time, they're able to split out and run routes. They're really good in space. … They're able to put them in different spots and create the matchups that they want. Create different personnel packages that look like three-wide-receiver looks but it's really two backs and one tight end. Steve Sarkisian was in his first season as the Falcons' offensive coordinator. He kept most of Kyle Shanahan's scheme, but the offense wasn't as potent. Atlanta ranked 23rd in the red zone and Jones, arguably the best receiver in the game, had only three touchdowns. Sarkisian's play-calling came under fire. On this third and 8 inside the red zone, he called for a play that had only one receiver run beyond the marker. Schwartz called the right coverage – it looked like a Cover 2 – and Bradham broke up a pass to Taylor Gabriel short of the sticks. Gabriel left in the offseason. The Falcons drafted receiver Calvin Ridley in the first round to take his spot (and number). Schwartz: They had a little bit of change in dynamic. They swapped one number 18 for another. Ridley caught five passes for 59 yards and a touchdown in the preseason. Quinn: We love the addition of Ridley into our offense. Ridley will line up some in the slot, as will Jones and Mohamed Sanu. Sidney Jones is expected to get his first start in the slot, but as Schwartz alluded, the Eagles are likely to use a combination of players in nickel. Safety Corey Graham will be the "big" nickel defensive back and rookie Avonte Maddox could see time, as well. There is hardly any "stopping" Jones. The 6-foot-3, 220-pound receiver caught nine passes for 101 yards last year, but the Eagles kept him in check. Jones did most of his damage when faced up against Ronald Darby (five catches for 53). The Falcons love to go to Jones off play-action. Hicks: When you run play-action, you got guys in the run game, and you got Julio running a big crosser or a big dagger across the field, and then at the same time, they got two backs that are fully capable of isolating. They can spread the ball over the field. Jones will line up all over, so Darby, Jalen Mills and others will take turns covering him. Schwartz is unlikely to have one defender trail him. On this late fourth down, the Falcons motioned Sanu next to Jones in the slot, and got the latter matched up against Jenkins. Jenkins: They have versatile players that they move around that create matchups, different looks. We just have to be ready. Schwartz: We'll miss Nigel for this game. He's not going to be replaced by one person. I'll just say that. Bradham, Mills, Fletcher Cox and Brandon Graham were the defensive stars of the playoff game. Bradham had only four tackles, but two were for losses. He also had a pass breakup and a sack. He got to Ryan here with an A-gap blitz. Hicks, who was out for the season, was responsible for breaking down how Ryan and the Falcons handled pressure. Hicks: He was getting the ball out and seeing the right reads almost every time. Schwartz blitzed on only 9 of 39 drops, but Ryan completed just 3 of 7 passes for 46 yards and was sacked twice. Faced with fourth down at the 2-yard and one minute remaining, Ryan rolled to his right. Jenkins and safety Rodney McLeod barked out the play just before the snap. Schwartz: What they did is they recognized a formation and how offenses sort of employ that formation. It wasn't like, we got a telegram that said that they were running that play. They made an educated guess, so to speak, based on the information that they were given. There was a lot that went into denying that touchdown, but Ryan's last-gasp heave to Jones over Mills wasn't caught. Quinn: I never get disappointed when we got Matt throwing to Julio. Those are usually good endings.